$150 per hour includes exclusive use of the theatre, banquet room, and lobby. 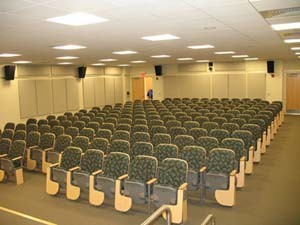 Rental includes use of the Conference Center technology with an easy to use touch screen system. $100 per hour includes use of our 174 seat theatre with fully integrated technology and lobby access for registration and coffee breaks. $50 per hour includes use of our banquet hall for dining, integrated technology, and lobby access for registration and coffee breaks. $50 per hour technical support fee includes an on-site tecnician to monitor your event. Catering services are provided through exclusive contract by Sodexo Campus Services. 15% service charge added to menu prices. 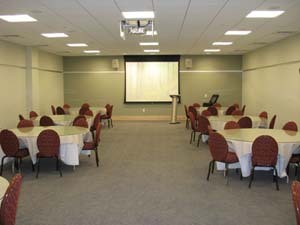 The Conference Center is equipped with a full service kitchen to support all of your event needs. Catering services are provided in the banquet hall and some catering services can be provided in the lobby area. Food and drink are prohibited in the theatre. Insurance is required. Garage parking rates for Conference Center bookings are included with rentals. Convenient and plentiful parking is available in the 621 space parking deck located just above the Conference Center. Parking can be validated at the front desk at the conclusion of your event. Our guest parking validation system allows for seamless invoicing to clients so conference guests do not have to pay individually.